This charming little hen can really strut her stuff. 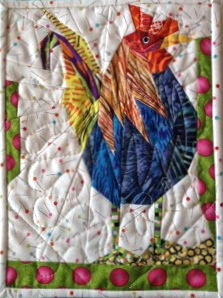 A tiny version of my “Barnyard Queen” design, this quilt was donated to the Alzheimer’s Art Quilt Initiative to honor my friends who suffer from this terrible disease. You can learn more about this fund raising effort at www.alzquilts.org.